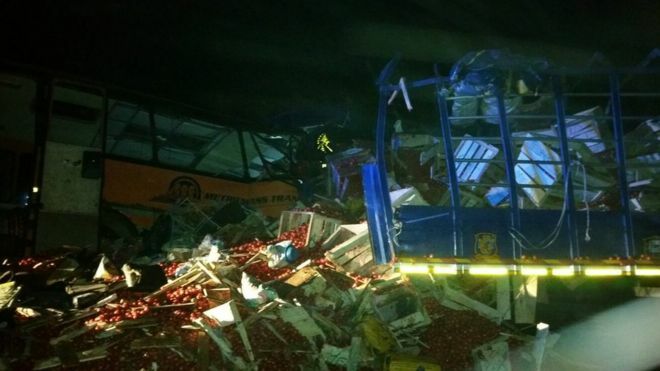 On Wednesday evening at about 20:00 GMT, a truck loaded with tomatoes and a metro mass bus smashed into each other around a town named Kintanpo in the Brong Ahafo Region of Ghana. Initially, 53 people were reported dead and twenty three sustained severe injuries. However, a medical officer of the Kintanpo hospital has said that more passengers have lost their lives and the number of deaths recorded has risen from 53 to 63, including a pregnant women and a child who is believed to be around 3 years of age. According to an injured passenger of the accident, the bus developed a brake problem in a town around Techiman, approximately 62 km away from the accident site and the driver stopped to fix it but the mechanic called upon could not solve the problem. The driver, determined and unaware of the disaster ahead, decided to move the bus to the next town where he could solve the problem but unfortunately for them, the brake of the bus failed on a sharp curve and smashed into the cargo which was carrying tomatoes. 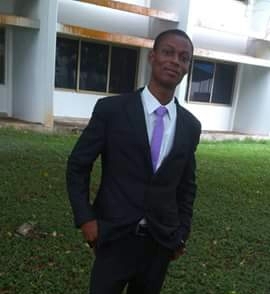 My name is Adoboe Selorm, a level 200 student studying economics and geography in the University of Cape Coast, Ghana.